The expansion of a binomial for any positive integral n is given by Binomial Theorem, which is (a + b)n = nC0an + nC1an-1b + nC2an-2b2 + ...+ nCn-1a.bn-1 + nCnbn. 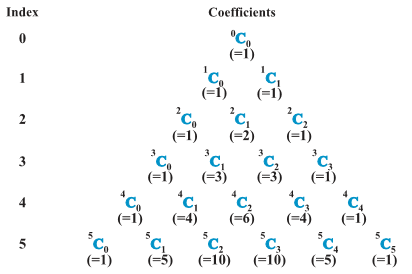 The coefficients of the expansions are arranged in an array. This array is called Pascal’s triangle. The general term of an expansion (a + b)n is Tr+1 = nCran-rbr. In the expansion (a + b)n, if n is even, then the middle term is the (n/2 + 1)th term. If n is odd, then the middle terms are (n + 1)/2 th and [(n + 1)/2 + 1] th terms.